Tolga Bat Hospital changed my life. I made friends for life both bat and human. I came to volunteer for 3 weeks and stayed 9. Then I came back for a second time to release the pups back into the wild – the pups I’d helped to rear earlier. I have never felt more at home and myself than when I’m here doing what I love. Every day is different at the Bat Hospital. It can be challenging, hard work but also beyond fulfilling and rewarding. One month is not enough time to spend in this beautiful paradise. I shall return every year for the rest of my batty life. I cannot thank you enough for making my dreams come true, for every thing you taught me and more. Once you go BAT, you never go back! Brandon, Jenny the Bat Hospital Director and Katherine. In my 2 week stay with Jenny (near the end of the flying-fox baby season) I had what I can only describe as a life-changing experience. My wife Katherine and I found something in caring for the the flying-foxes and micros that we had never experienced before. I found a love for labor and animal handling while doing something that caused me to beam with pride. As a foreigner to both the location and the work (American, Software Developer) I had general fears of Australia and bats; those fears were eradicated in the first 24 hour of being at the facility. I can only hope that life will give me another opportunity to come to Jenny’s bat-paradise, it truly is one of the happiest memories in my life. OH and Jenny is an amazing cook, don’t worry about food… you will be very happy. PS. Katherine is the brains behind this new website! She is a software developer. Claudia Aguilar, Veterinarian, Mexico Dec 2017. For two years I wished to come to Australia and meet this fantastic species. The time waiting to be able to come to volunteer at the Tolga Bat Hospital was definitely worth it. I spend only 3 weeks and believe me, it was not enough time. Jenny is a wonderful person you would be able to learn many things from and the place is charming to enjoy if you get to have some free time. Volunteering at the Tolga Bat Hospital was one of the most amazing experiences I have ever had with animals, being able to have such a close encounter and actually hold the baby bats every single day is a wonderful experience that you don’t get in every place. You get to be a foster mom of this amazing species and create a positive impact on the environment by helping to raise these babies. Volunteering at the Tolga Bat Hospital was one of the best experiences I’ve ever had in my entire life! 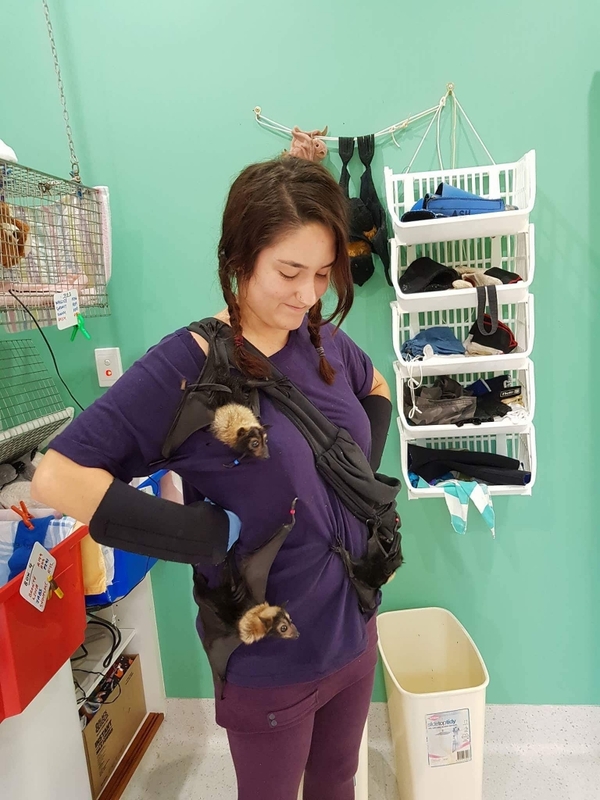 I had never worked with flying foxes before and I was given the opportunity to have a lot of hands on experience handling them at the bat hospital. It was such a rewarding experience to watch the babies grow and learn. I volunteered for over one month and I learned something new and interesting every single day. This was truly a once in a lifetime experience. I would defintely recommend volunteering here to everyone! My time spent at the Tolga Bat Hospital was extremely rewarding. Speaking as someone who has worked in Zoological institutions and with wildlife in situ for 25 plus years, I can categorically say that their standards for animal husbandry and medical care are extremely high. Jenny and Ashleigh teach all the volunteers thoughtfully, explaining both procedures and policies clearly through demonstration and documentation. I learned so much about fruit bats that I was able to bring back to work with me. The camaraderie between the volunteers is quite strong as we spent most of our waking hours together. I still found time for early morning bird watching and time to read at various points during the day. As I was there in November, I even cooked a traditional American Thanksgiving day dinner for volunteers from Australia, Canada and Sweden! I hope I can return to volunteer again as it was my true honor to be part of this team working to save bats. 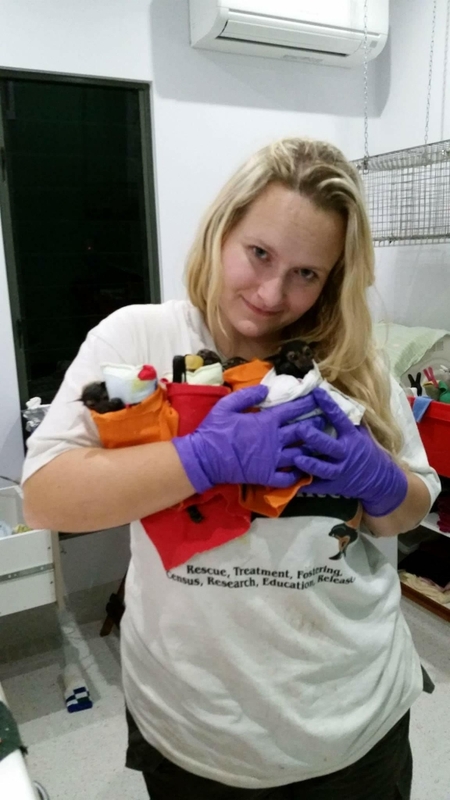 My first 5 weeks of volunteering at the Tolga Bat Hospital was in Jan 2016. It was a rich fascinating experience with a lot of learning and joy. I was absolutely sure I’d come again for a second time. I returned to this nature paradise for 4 more weeks in Nov 2017. During my first stay I experienced working with the older juvenile flying foxes (Spectacleds and Blacks) and enjoyed the good feeling when they were released. The second time, in November, I learnt to handle the young babies, feeding and taking care of them. It was a great pleasure to see how much these little animals believe in you, when you are interacting with them. In looking after the bubs every day there was always something new to deal with: going to the forest to search for orphans, rescues on the community, releasing recovered adult, special treatments, and tourists in the afternoons at the Visitor Centre, and new-born microbats. It was very busy but still there was enough time to enjoy the garden around the hospital with its rich birdlife. Also butterflies and possums are to spot. I met many interesting people – local and fellow international volunteers, scientists, Ph.D. students and film crews are interested to come to the hospital to meet Jenny. Volunteering at the Hospital is one of the best ways to come close to Australian wildlife and get know to the real Australia. When I was fortunate enough to get the chance to volunteer at Tolga Bat Hospital I really had no idea what was in store for me. Within an hour of arriving I had a tiny little baby spectacled flying fox in my hands, sucking her way through a bottle of milk. Her name was Gracie and I was instantly in love & completely fascinated. She was the first baby bat or ‘bub’ that had arrived that season. There were about 180 bubs by the end of the season. After that it was non stop fun, hard work, excitement, fascination and friendship. The next month was both the best & the hardest work in my life. What I learned from Jenny & the wonderful team of volunteers at TBH was incredible. The work done at the hospital is amazing & plays a key role in the survival of these incredible species. The work during the orphan season is hard. 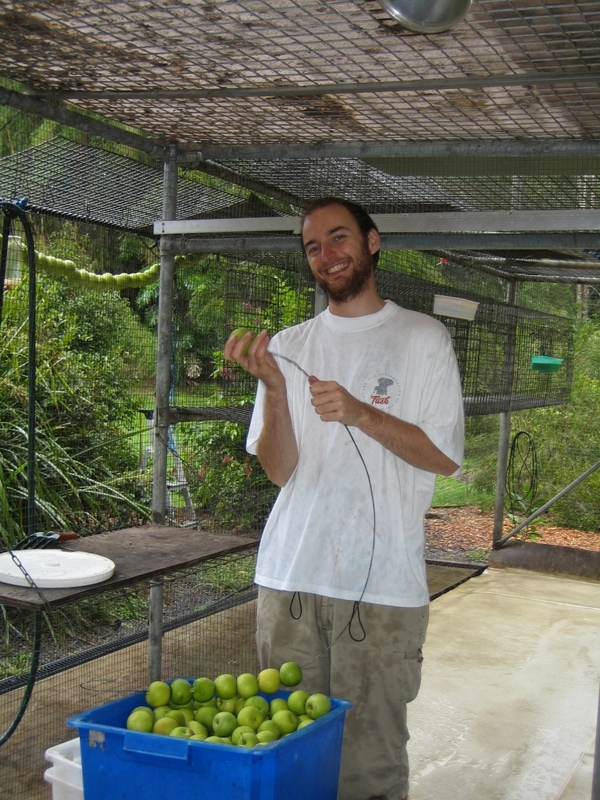 Cleaning, preparing food for the bats, handling & cleaning bats, feeding bubs goes round the clock. However, all the hard work is completely worth it to get the opportunity to do what you get to do. I always loved fruit bats, but I left there completely obsessed. I also met a few lifelong friends in my time there, both human and bat kind! One of my special little bat friends was Ivy (who I got to name) who had unfortunately lost an eye pretty young in her little life. She was the best little character and I still often think of her and all the other orphaned bubs we helped to release that year. I feel extremely proud to have been a part of such an incredible team, and such an amazing mission. If I didn’t live on the other side of the world, I would be back every year! PS Hannah called in on her honeymoon 2 years later to help for a few days and to introduce her husband Ross. 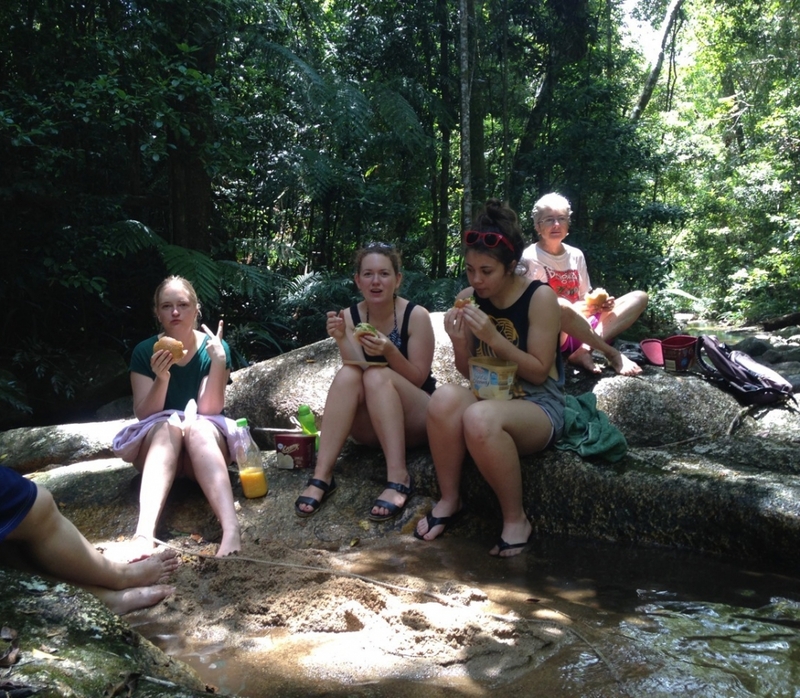 Photo (right): Sophie with volunteers having a picnic and swim on a hot day up in high altitude cooler rainforest. 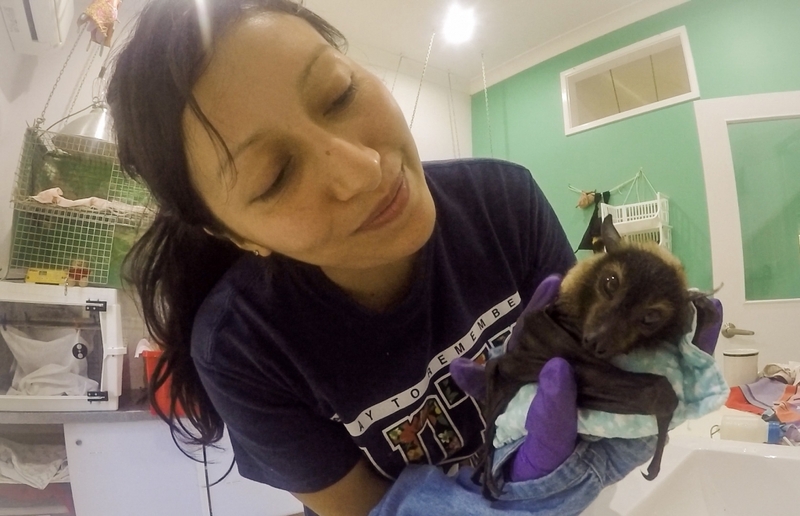 To say that this is a hands on experience is an understatement, not ten minutes after I arrived I was sitting in a chair in the nursery with my very first wrapped up spectacled flying fox baby looking up at me with those big curious eyes and my heart melted. It was a month of long working days, being a bat mum is a lot of work; feeding, cleaning (babies, milk bottles, cages, aviary, nursery…), keeping track of the babies developments, kissing bat baby bellies and tiny heads… and that’s just in the nursery, there’s micro bats and grown up residents as well to look after. So be prepared for a lot of fruit preparations and a lot of milk making for the babies bottles as well as picking out the nicest mealworms for the micro bats ;). But all that work was just fine with me, as the love you feel for the beautiful, funny, curious and adorable babies makes it all worth it. And I was back again for another month of baby season two years later :). At this little plot in the rainforest Jenny has created a truly special place where these threatened and endangered animals are saved, one life at a time. And I can not recommend it enough for anyone who’s already in love with bats or interested in these amazing creatures. Oh yes, one more thing; Be sure not to miss out on the chances of going to watch the twilight fly outs when the local flying fox colony leaves their trees and fly out into the night to forage for food. A truly wonderful and awe inspiring sight. Jenni is behind Lis Kernan (USA) in this photo. I have a degree in Zoology from Glasgow University and a keen interest in conservation, so I was very fortunate to come to the Bat Hospital and gain some very valuable experience. I studied microbats at university but there was never any mention of megabats, especially flying foxes. I have visited the hospital 3 times to volunteer in the 2 years that I have been in Australia and every time I learn something new. Things change here everyday, new rescues arrive, new volunteers and new medical cases. I have broadened my understanding of these amazing mammals and learned a lot about their special care. When I go back to Scotland I plan to go back to University to study Conservation in more depth. So that one day I can run my own wildlife sanctuary and conserve endangered species. 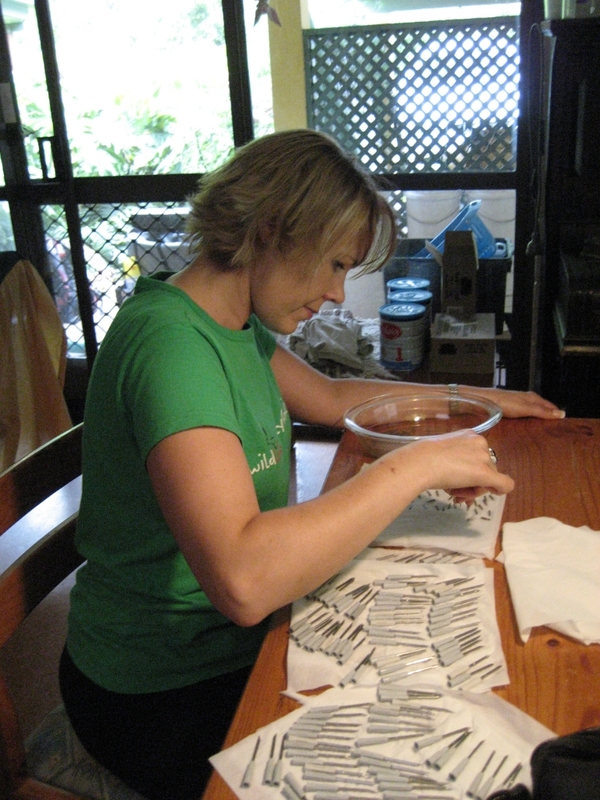 Photo (left): Nicki, a local volunteer, sterilising microchips. In the early years we microchipped all Spectacled flying-foxes being released. Volunteering at Tolga Bat Hospital during the winter season was a fantastic way to experience the daily operations of a wildlife sanctuary. While there were not hundreds of babies to be reared, the permanent resident adult bats offered plenty of opportunity to work with flying foxes. 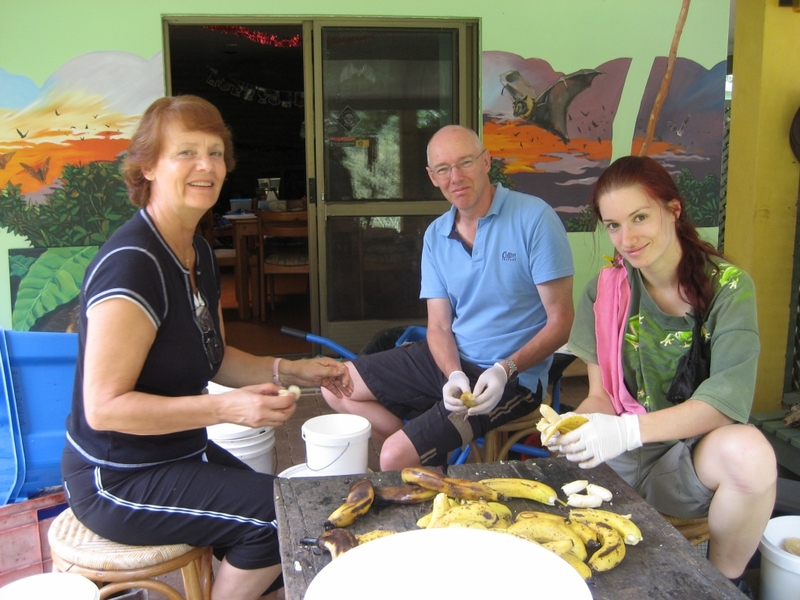 The daily cleaning, feeding and care for the bats provided more than enough hands on experience. During our 3 week stay, we were lucky enough to have three baby little reds to help raise. The hospital is open for tours during this time as well, which gave us the opportunity to connect with people and educate them about bats. It was very rewarding to share our enthusiasm with the public and watch their own interest develop in response. 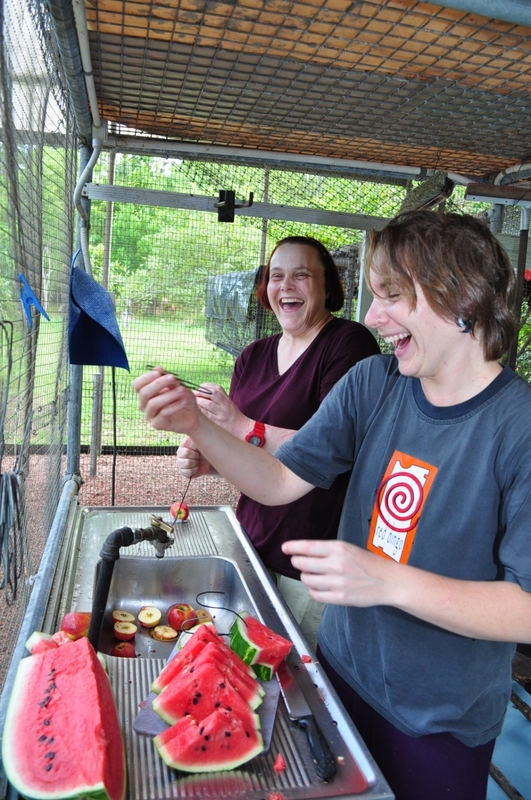 Volunteering at the bat hospital was a once in a lifetime experience to work with flying foxes and learn about wildlife rehabilitation and rescue! My stay at the Tolga Bat Hospital was rather short-notice. However, it was one of the best times I had in Australia – working with the babies, preparing the food for the adults, and helping around the cages… and all of that in a very familial environment. Lots of work, but lots of fun as well! I can only recommend going there and contributing to the cause – it’s a fixed point on my next trip to Australia. Though my time at the bat hospital was short it was an incredibly valuable experience. 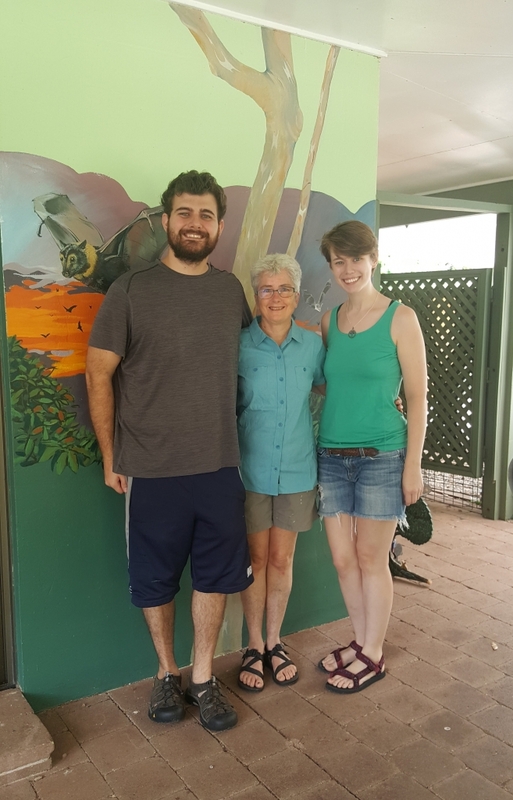 I didn’t want to travel overseas as a typical tourist and volunteering with the bats gave me the opportunity make a beneficial impact, see a country from a unique perspective and meet local people who want to make a difference in their own backyard. Most rewarding for me was the ability to work hands on with the bats, learn about their individual personalities, and about what ecological issues are of most concern to their survival. I’m glad to know that rescue organizations like the Tolga Bat Hospital are working hard to rehabilitate native species and I am lucky to have been a part of that effort! Elena Bridgens, Australia. December 2005. Leaving the steaming hot touristy Cairns for Atherton was like arriving at a little peice of paradise, especially as a bat lover! It felt as though not a metre of Jens property was batless, whether it be manmade or bat made. Nearly everywhere you went you could hear a little flap, cherp, see a little twinkle of an eye belonging to one of the most remarkable,splendid, loveable creatures nature has created and sadly one that faces more than its fair share of problems in their purposeful existance. I was to learn this during my three week volunteering stay at TBH. I was also to learn how to string some apples pretty darn fast! I arrived just after christmas, when the bubs were coming to terms with’leaving the nest’ in this case an existence nothing short of royalty. As the days went on, I got more and more attached to the lil guys.They gained their independance and were put intothe bigger ‘houses’ to prepare them for their release into the scrub. I honestly think I felt more pride with the release than taking my own child (if I had one) for their first day at school. As for staying at Jens, we volunteers were right up there with the royal standards too. Never short of some of the best food I have ever tasted! Comfy beds, our own quarters, lovely surroundings, and living amongst some of the most inspirational dedicated people in Australia! The work the TBH does can never be aprecciated enough, I would highly recommend being a volunteer! 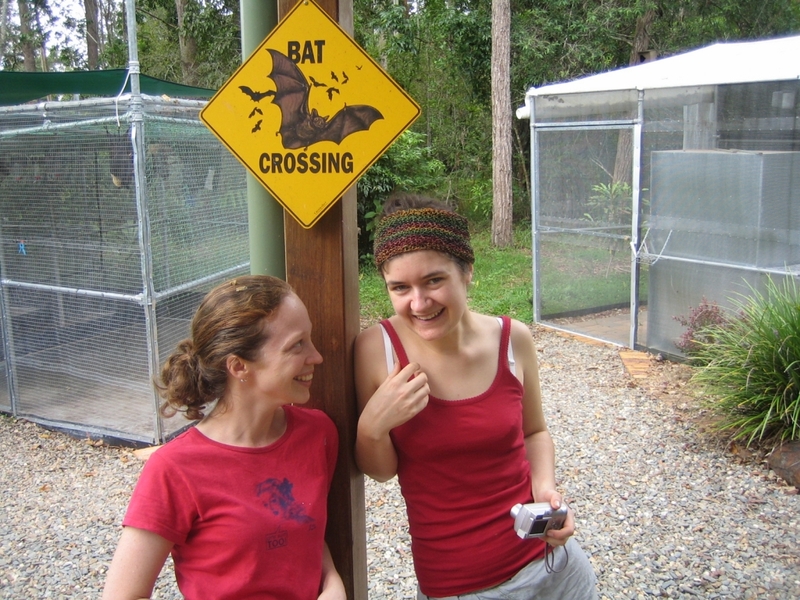 ‘In November 2004 we spent three weeks at the Tolga Bat Hospital as part of an eight month round-the-world trip. Within five minutes of arriving at the hospital we were handling and feeding our first orphaned spectacled fruit bat pups (known affectionately as ‘bubs’) – if it’s interaction with wildlife you’re after, Tolga Bat Hospital is the place to go! 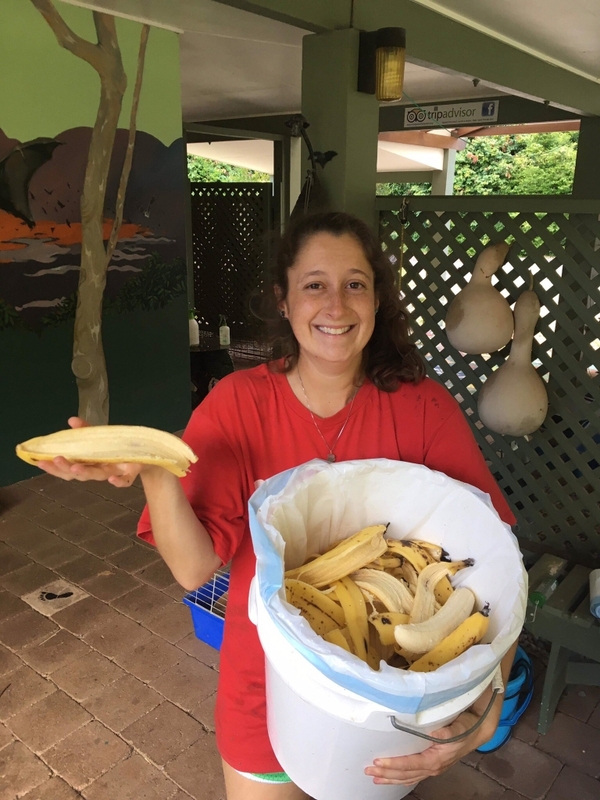 The next three weeks were a haze of preparing food, cleaning, handling, fussing and feeding – it’s hard work (often 16 hr days), but then again you’re working with and helping to save fruit bats! We also got to go out on rescue trips and conduct some colony surveys (the evening skies filled with thousands of spectacled and little red fruit bats heading off in search of food). The spectacled fruit bats on the Atherton Tablelands are in a precarious position, and the work of Jenny Mclean and the bat hospital volunteers is playing a crucial role in their continued survival. We feel proud to have been able to make a small contribution to this cause. 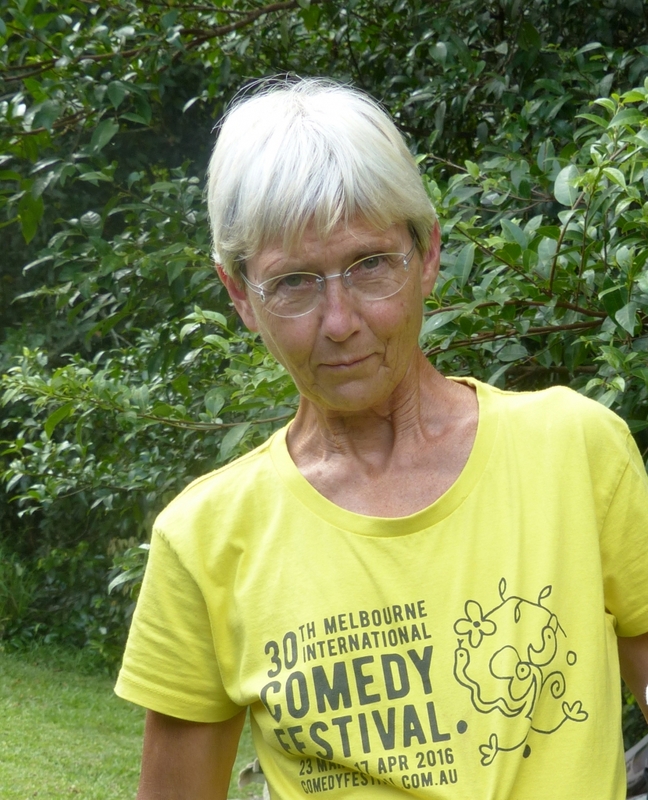 Antony returned in 2008, and Abie is now a resident in Australia and has returned numerous times.